Coolpad Max first impressions: A dual smartphone that actually makes sense, but is it worth it? Coolpad Max is a good investment, but the competition in the market makes it hard to succeed like its predecessors. Coolpad launched its first flagship smartphone, Coolpad Max, in India on Friday. The high-end smartphone falls under the same category as Smartron t.phone, YU Yutopia and the upcoming Yunicorn smartphones. Coolpad has touted the dual-in-one feature of the Max smartphone as one of its biggest USPs, among other features that could actually grab attraction. We got our hands on Coolpad Max and found its design quite appealing. The handset certainly offers a premium experience, which is made possible by the combination of impressive specifications. Here are our first impressions of the Coolpad Max. Coolpad has a limited number of smartphones in its portfolio, but it makes it a point to stand out in the crowd. Coolpad Max is a carefully crafted device with every detail spelling out class. At first sight, Coolpad Max was a total charmer. Looking at the device carefully brought our notice to some tiny details that make absolute sense. Firstly, the display of the Max smartphone has a 2.5D Arc design, which puts a slight curve around the edges of the screen. It is followed by a polished metal lining and continues with a matte finish, and a scratch-resistant metal unibody going all the way to the back. The rear design of the Max smartphone is kept simple and elegant. The primary camera module and the dual-tone LED flash are placed at the centre top and the fingerprint sensor is found just below it. The company's logo is printed at the bottom. On the sides, there is a power/lock button on the right alongside a SIM card + microSD card tray, and the volume buttons are placed on the left. The speaker grille at the bottom of the device surrounds the microUSB charging slot. A 3.5mm headphone jack sits at the top. The edges are curved and offer a comfortable grip. Overall, we find Coolpad Max's design completely fresh and unique. The handset is compact, handy and non-slippery, which is the case with most metal phones out there. Coolpad Max's camera is on a par with most high-end phones we have reviewed in the past. The flagship features a 13-megapixel camera with ISOCELL sensor, 6P lens, f/2.0 aperture, PDAF and dual LED flash on the rear, and a 5MP snapper with f/2.2 aperture on the front. Given this configuration, the Max smartphone is poised to deliver good-quality images. The camera performance of the Max smartphone will be determined in our impending review of the device. As for the camera's UI, Coolpad Max has kept things simple. It launches on the photo mode and swiping to right and left (in portrait mode) will change modes to video, night, beauty and pro. Next to the capture button at the bottom, there is quick access to filters and album. Users can switch to the selfie camera with a single tap at the top and also adjust the flash. The three horizontal dots lets you access detailed settings and other modes, including GIF, Sound and Shot, Refocus, PickZoom and Long Exposure. Coolpad Max features a dual operating system with BiLogin that can be used to keep personal data in an encrypted space. 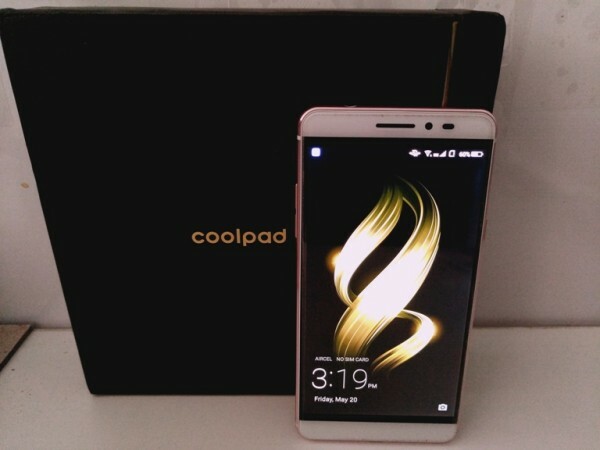 Coolpad has defined the two spaces as external and internal systems. The internal system ensures calls and texts are encrypted for added security. The handset also has dual SIM and dual standby 4G support. The process to set up the private space is simple. Tapping the key icon on the home-screen will take you to the internal system, where users can go to settings and set up a password lock. Users can use fingerprint authentication to enter the private space every time or use the passcode or pattern lock, whichever is used to secure the space. The benefit of the private space is it can be used to store personal photos, files, music, videos and also have a second WhatsApp and Facebook account inside the private mode, which is unique and useful for users with two numbers and accounts. While it is too soon to comment on the handset's performance, we haven't been disappointed with Coolpad Max so far. It works lag-free, but we are yet to test the handset under extreme conditions. As for the specs, it is powered by a 1.5GHz Qualcomm Snapdragon 617 octa-core processor and 4GB RAM. Coolpad Max offers 64GB storage along with a microSD card slot, which is a hybrid one. It runs Android 5.1 Lollipop with Cool UI 8.0 on top of it, which delivers a new experience even for Coolpad users. The Max also packs an impressive 3,000mAh battery with Quick Charge 3.0 tech. The charger that comes with the Max has a dim LED light with a switch to use it while plugging it in dark environments. The charging is pretty fast, but we will be testing the device's battery life in depth in our full review. We have reviewed all Coolpad smartphones and the fingerprint scanner has been one of the uncompromised features. As we had expected, Coolpad Max also delivers similar accuracy and speed in recognising the registered imprint. The company claims to have integrated an upgraded sensor, which should ideally recognise the fingerprint even with a wet finger. Sadly, we did not have the same level of accuracy. Out of 10 attempts, the handset let us in only once with a wet finger. Coolpad Max is priced at Rs. 24,999. If we recall correctly, YU's Yutopia was also priced in this range and was doomed with an "overpriced handset" label. If we are looking at the specifications and design, we are convinced it is a good investment, but the branding comes into play when buyers are spending such a huge amount on a smartphone. Coolpad has also missed out on some key points, such as the lack of a USB Type-C port, which is pretty much a standard for handsets priced at this range. Smartron launched its t.phone on May 19, which offers competitive features at Rs. 22,999 and YU is expected to launch Yunicorn on May 31 that is likely offer good competition. Xiaomi already has a Mi 5 that is selling at Rs. 24,999, so Coolpad has a tough competition at this price range.